Can you grow palms in Europe? Is the most heard reaction. Everybody knows the “coconut tree” but what do we really know about palms? There are around 4000 palm species worldwide, all of which belong to the Palmae or Arecaceae family (both names are used). 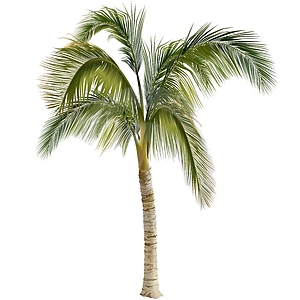 Most of the palm trees are native to a tropical or subtropical climate, but there are also hardy species. Here’s an introduction to the world of palms. Is a palm tree a tree? The name palm “tree” suggests that this plant is closely related to the the well known and commonly spread deciduous trees. But is the palm tree actually a tree? In order to be able to answer that question we need to go deeper into the botanical background. In the world of plants, plants are divided into two large groups; flowering plants (angiospermae) and gymnosperms (gymnospermae). In this group we find all the plants that produces seeds within an enclosure, in other words, fruiting plants. Within this group we distinguish dicots and monocots. More about this last group later on. A large group of plants. The monocots or monocotyledons include many plants whose seeds are of major economic importance, such as major grains (rice, wheat, maize, etc. ), but also forage grasses, sugar cane, and the bamboos, palms, bananas, gingers and their relatives, turmeric and cardamom (Zingiberaceae), asparagus, and the onions and garlic family. In many monocotyledonous plants, the food reserve is stored in the endosperm. Inside the seed there is only one cotyledon (embryonic leaf) hence the name “mono”cotyledon. 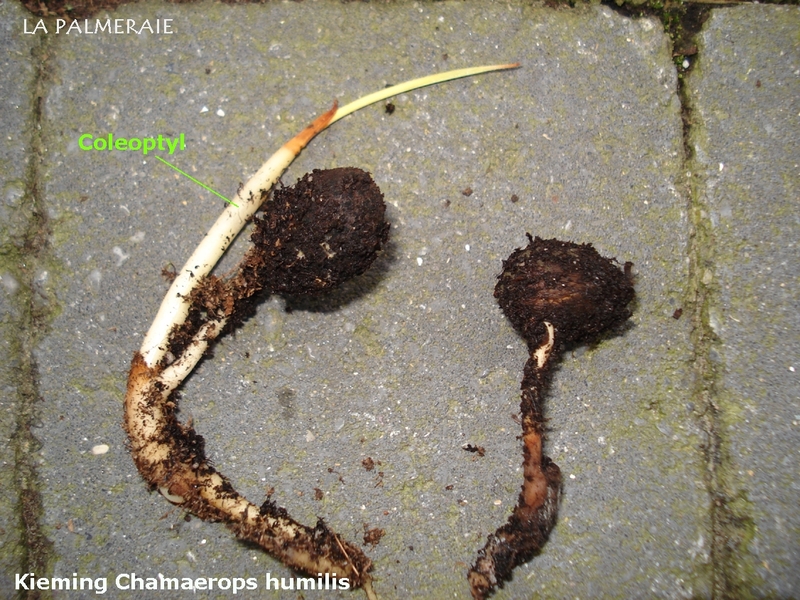 When germinating, first a kind of protective sheath, the coleoptile, emerges above the ground, protecting the emerging shoot. So, our first question is answered, the palm tree isn’t really a tree. One of the most typical differences is the lack of secondary growth. Palm trees utilise an anomalous primary growth form described as establishment growth. The axis undergoes primary thickening, that progresses from internode to internode, resulting in a typical inverted conical shape of the basal primary axis. Roughly, a palm consist of roots, a trunk and foliage (crown). Below we will review these parts more closely. 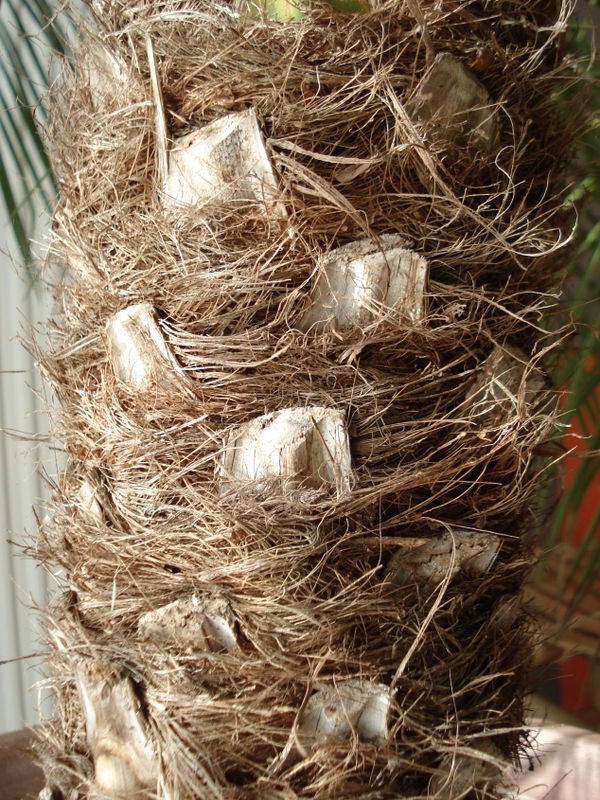 As mentioned above, palms roots lack secondary growth. All roots develop directly from the stem basis on a root initiation zone which can be above and below ground. These roots will mainly go straight down looking for groundwater and are not agressive or destructive. No plant can exist without water. Palm trees in very dry areas therefore indicate the presence of groundwater or were planted by men and are regularly watered. In addition, older palm trees, which already have developed some height, will form aerial roots just above the ground at the stem basis which can make it increase slightly in thickness or give it a bulky impression. 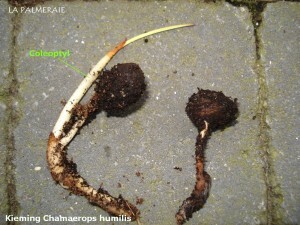 An important function of these roots is the anchoring in the ground to support the palms weight. Like all monocots, palms do not have the ability to increase the width of a stem (secondary growth) via the same kind of vascular cambium found in non-monocot woody plants. This explains the cylindrical shape of the trunk (almost constant diameter) that is often seen in palms, unlike in hardwood trees. However, many palms, like some other monocots, do have secondary growth, although because it does not arise from a single vascular cambium producing xylem inwards and phloem outwards, it is often called “anomalous secondary growth”. The trunk is in fact only composed by old dried petiole bases tightly stacked on each other and has no bark as hardwood trees do have. Before a young palm gains in height, a certain trunk diameter must first be achieved. Therefore, a young palm grows much slower than an older one. Some species have a stem covered with fibrous threads between the petiole bases. Some of these species may loose these fibres on the older parts of the trunk; like the Phoenix. Palms always develop one new leaf or “frond” at a time. When the frond isn’t unfold yet, we call it a “spear”. Only when the frond was completely formed it will unfold and immediately have its final size. As mentioned earlier, a palm tree does not have the species-specific leaves immediately after germination. The first leaves do have much more in common with grass leaves. At this stage, many palm species are similar to each other and harder to recognize with certainty. The leaves or often shiny or covered with a wax layer and ribbed. This to prevent from dehydration. The petiole often is covered with spines. Young palms do not bloom. This will only happen at a certain age. The exact duration differs from species to species and varies between several years up to 50 years. Most palms bloom annually. 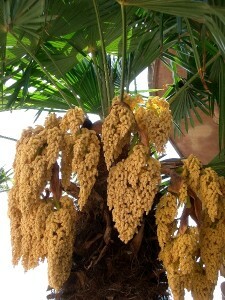 The pollination of palms occurs through the wind, so no colorful flowers are formed in order to attract insects. The inconspicuous, short living flowers are formed on a inflorescence just below, inside or from the crown spread widely out. The flowers can be monoicous or dioicous depending on the species and sometimes even of the season! After successful fertilization palms form so-called stone fruit or drupe. The spread of these seeds differs from species to species; the well-known coconut floats well on water for spreading through the sea. Other species a spread by consumption; simply think of dates of the Date palm by exemple. The palm tree has been cultivated by humans for almost 5000 years. This began in the Middle East with the Date palm (Phoenix dactylifera) but soon expanded to other regions with other palm species. Furthermore, for consumption, we know fruits like the awarra, coconut, moriche, palm peach and salak. Palm oil is widely used for food preparation, soap and fuel. And wickerwork is made from rattan of Calamus Rotang. Coconut mats are made of coconut fibers. In Hindu culture, strips of palm leaf were used as paper. However, this is very perishable in a tropical climate, so that most of the manuscripts written on it are lost. 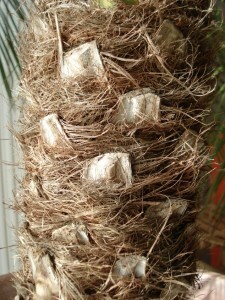 And there are many other purposes for which the palm is cultivated by humans. But in our climate we mainly find them for decorative use.